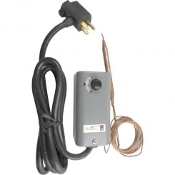 ager year round with this external overriding thermostat. It installs on a fridge or freezer to maintain optimal fermentation temperature—trying to lager in a fridge without an external overriding thermostat results in temperatures that are too cold for yeast or even in frozen beer. Plug the appliance of your choice into the thermostat, then plug the thermostat into a standard 120V outlet. An analog dial lets you set the setpoint temperature between 30 and 80°F, with 1 degree increments. The Johnson Control thermostat has a 3 1/2 degree differential, which means that the thermostat will shut the fridge or freezer off (stop cooling) at 3 1/2 deg below the setpoint and start the unit (resume cooling) once internal air temperature exceeds the setpoint—the effect of this fluctuation on the actual temperature of fermeting wort or beer will be insignificant.